Lately I've had a major craving for anything Catherine Malandrino. Her pieces are bursting with bright colors for spring and summer and they have a really fun, flirty, and charming sensibility about them. Because I love them so much and have worked with them for so long (even pre-blog! ), I am happy to announce that I can offer a 20 percent discount especially for you, my dear readers, to use in any Catherine Malandrino boutique until Monday, April 26th! All you have to do is whisper "Saucy Glossie" when you pay to receive the discount. 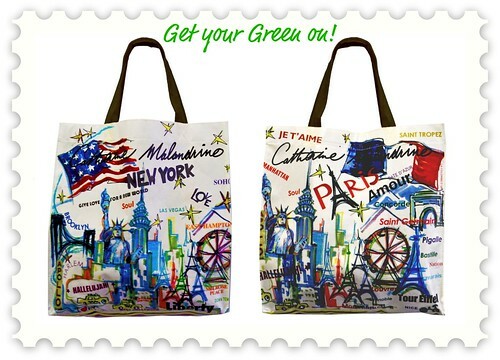 Don't forget that Catherine has designed limited edition eco tote bags in honor of Earth Day, which will be selling in her boutiques nationwide this week.